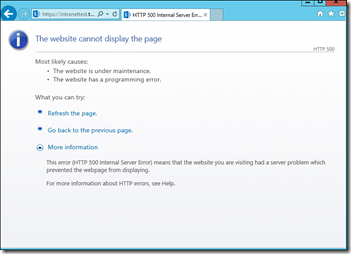 This error (The website cannot display the page) can be thrown due to a number of reasons but I’ll will show the issue and solution we had after a few SharePoint 2013 installations. 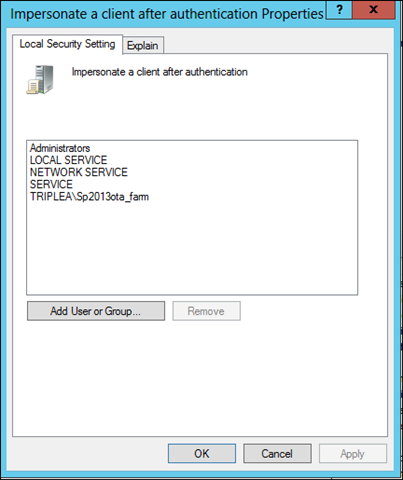 We installed SharePoint 2013 correctly and verified if everything was up and running. The databases and websites were online and Central Administration was working. We only got the below error while browsing to our Web Applications. We found the following errors in the ULS logging using ULSViewer. 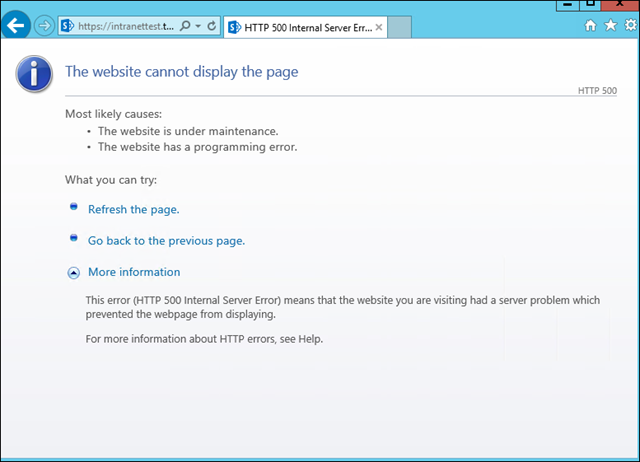 Application error when access /SitePages/Home.aspx, Error=The given assembly name or codebase, ‘C:\Windows\Microsoft.Net\assembly\GAC_MSIL\System.ServiceModel\v4.0_4.0.0.0__b77a5c561934e089\System.ServiceModel.dll’, was invalid. System.IO.FileLoadException: The given assembly name or codebase, ‘C:\Windows\Microsoft.Net\assembly\GAC_MSIL\System.ServiceModel\v4.0_4.0.0.0__b77a5c561934e089\System.ServiceModel.dll’, was invalid. at Microsoft.SharePoint.Library.SPRequest.PreInitServer(String bstrAbsoluteRequestUrl, String bstrServerRelativeUrl, Int32 lZone, Guid gApplicationId, Guid gSiteId, Guid gDatabaseId, String bstrDatabaseServer, String bstrDatabaseName, String bstrDatabaseUsername, String bstrDatabasePassword, Boolean fHostHeaderIsSiteName, String bstrAppHostHeaderRedirectDomain, Boolean fAppWebRequest, String bstrAppDomain, String bstrRequestAppWebDomainId, String bstrAppSiteDomainPrefix, Int32 iDatabaseVersionMajor, Int32 iDatabaseVersionMinor, Int32 iDatabaseVersionBuild, Int32 iDatabaseVersionRevision). 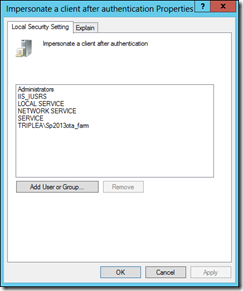 After investigation we found out that the customer controls a lot using group policies and we verified a few policies with a working SharePoint 2013 environment. The customer had removed the local group IIS_IUSRS from the group policy ‘Impersonate a client after authentication’ under Local Policies –> User Rights Assignment. Central Administration was working correctly because the farm account was still present and because the farm account is member of the local administrator group. We added IIS_IUSRS back to this policy and performed an IISReset. All Web Applications were up and running after the reset.